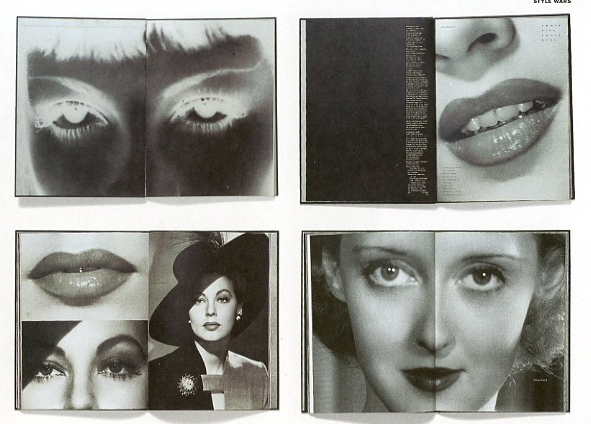 “Those lips, those eyes” by Edward Z. Epstein & Lou Valentino. They say “never judge a book by its cover”, but I do. I judge books by their cover all the time, but not only books, I judge everything buy its cover (at list at the first impression). 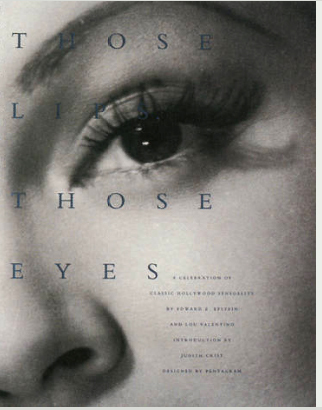 This book is full with beautiful black and white photographs of the stars of Hollywood’s Golden Age, people who were screen legends who burned up the screen and captured the very embodiment of sensuality with a special emphasis on their eyes and lips. I’ve chosen this book because it is full with covers to judge, both literally and metaphorically. Each photo to me looks like the cover of some book\magazine or like a poster\advertisement, and each iconic figure is also a “cover to judge”. That makes the book twice as interesting to me. I can look at each page or each photo and think about it, do I like the photo? Is it well made? What does it tell me? And so on. But I can also look at each character and have my thoughts about them, about their looks, do I recognize them? What do I know about them and what does the picture tell me about them? This book with it pictures still gives those feelings even after so many years, these photos are still so sensual and glamorous which makes them relevant even today. Besides, when something is concerning the mysterious and tempting life of old Hollywood, that is reason enough for me to choose it. If the three books of these postings would meet, they would be like strangers staring at each other seeking something in common to speak about. From the child in fashion, dating back in content and production, to the nomad designer in it’s contemporariness and the language of art drifting in between. They were all connected by the same criteria of chance; being strangers by name, but not unfamiliar by the subject, books which I passed judgment on by their bare covers. In the end, a conscious (or subconscious) choice, they all became connected into a context. The links between the words and the pictures and the connotations which they created. The tagwords of the book forms into disappointment. Twice. When picking up an unknown object, a book, the idea of it’s properities and contents start to form in my head even before opening the covers. The title and the graphics become like tag words in a jungle of random and anonymous ideas yet to be discovered. Sometimes, these ‘tag words’ speak so clearly about the content, that the idea forming in my head corresponds to the unfolding story, and sometimes the subject is so open that my idea and the idea of the author digress from each other so much that the ‘need’ the idea of the book created is left unfullfilled. For the 2nd time in a row, the criterias whilst searching have been the same with a lot of influence by mere chance. There is something tempting and intriguing about the subject itself / which creates interesting openings in my mind / but when shifting through the pages I discover that the need it creates leaves me with a bitter taste of unfullfillment. Failure of one, is the inspiration of another. Even a single glance at a book cover becomes a decision, a judgment, based on certain criteria. The book was misplaced, and it’s covers where filled with esthetically, (slightly), unappealing elements. What caught my eye was the title, or rather the implication of the subject. Even though the subject itself bears no great interest, I’ve seen other books with the same main idea which contained beautiful material purely visually. This one did not. Instead, it contained another element that is in itself intriguing – photographs which bordered into becoming artificial and forced. Though, if the book had felt like a perfect compilation on this, I would have left it at the shelf after looking through the pages. Instead, it’s borders almost reaching something interesting / but not succeeding / was what made the decision of checking the book out, and it ending up in my backpack.